With the Indianapolis Colts, New England Patriots, San Diego Chargers, Minnesota Vikings, Houston Texans and Washington Redskin all on a BYE week, fantasy football owners are going to have a hard time replacing some important fantasy football players. Whatever you do, do NOT jeopardize your future just for a one time use QB or TE. Think twice before dropping someone! Nick Foles injury has led to Mark Sanchez returning to the NFL spotlight. With so many QBs out Week 10, someone in your league will have to start Sanchez, and if it must be you, so be it. That offense will make any QB a decent fantasy option. Plus if it works, you can say that you beat your opponent with Mark Sanchez as your QB! Odds are, if you are missing a QB this week, you don't need to make a waiver move to claim a one week starter. Let the league dictate who starts for you in Week 10 and use your waiver priority on a more important, permanent player. Arian Foster was last seen walking off the field in frustration, after suffering a groin injury. The Texans are going into a BYE week, but if Foster is to miss an extended period of time, Alfred Blue would take over for Houston. This is the week to pounce on him, if you have a bench spot available and player you can drop. You will hear the name Charles Sims all week, the rookie out of West Virginia, but be careful with him, as Bobby Rainey has established himself as a legit running back, and the Bucs still have Doug Martin, whatever that really means. Lamar Miller left the Dolphins shutout victory over the Chargers early with a shoulder injury, and he missed Week 10, Daniel Thomas and Damien Williams will try to run against the Lions defense. Fool me once, shame on you. Fool me twice, shame on me! Don't fall for Jaguars Allen Hurns 2nd two TD week of the season. He did it week 1 and up until week 9 had totaled just receptions before exploded for 7 catches and 112 yards. The Jags get the Cowboys at home and then a BYE week, don't waste your waiver move here! With the way the Steelers offense is operating and Ben Roethlisberger tossing 12 TDs in the last two weeks, Martavis Bryant is the WR to add this week! The Steelers rookie has 5 TDs in 3 games and Pittsburgh gets the Jets in Week 10! 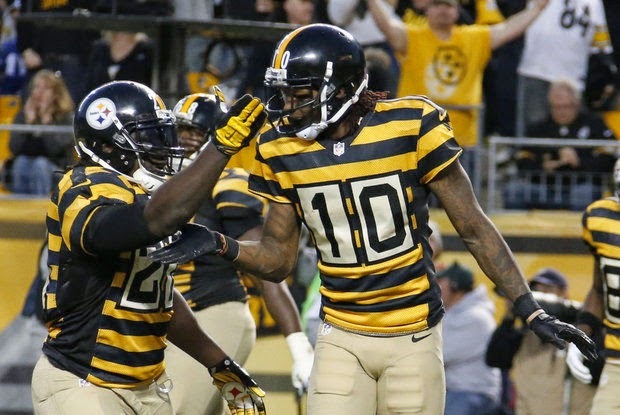 Can the Steelers Lead Your Team to a Fantasy Football Championship?